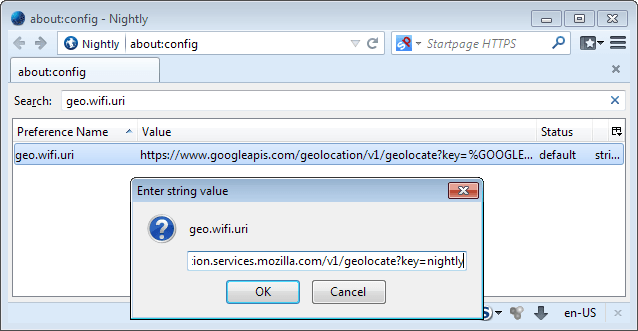 Do you use location-based services in the Firefox web browser? Depending on the websites and services you visit on the Internet, it can be quite useful at times especially if you use it while on the go. Think of a maps application jumping straight to your current location, sites that relevant content to you based on your location, or eBay loading the regional site for you for your convenience. Geolocation has been broken in my version of Firefox for some time now, and I have not figured out yet why that is the case. Anyway, if you use location-based services in Firefox, you may find the feature useful. Mozilla is using Google's geolocation service in Firefox by default, which means that any request to look up your location is submitted to Google. While it is not clear if the information is recorded by the company, it may be reason enough for you to search for an alternative instead. Turns out that Mozilla has been working on its own geolocation service for some time now, and while it is not yet ready for prime time, you may want to check it out just to see if it is usable where you live. You see, the core problem here is that data is needed to look up your location properly. Mozilla has created an application for Android, MozStumbler, which collects those information when run, and while many larger cities and popular areas are already covered by the service, lesser populated areas may still lack the necessary data to look up user locations properly. The main advantage of using Mozilla's own service is that data is not submitted to Google anymore on each look up. If you trust Mozilla more in regards to privacy than you do trust Google, it may be a good thing to make the switch to see how this works out for you right now. Update:Recent versions of Firefox use the Mozilla location service and not Google's anymore. You can verify that this is the case by loading about:config?filter=geo.wifi.uri in the browser's address bar. The value should read https://location.services.mozilla.com/v1/geolocate?key=%MOZILLA_API_KEY%. Type about:config into Firefox's address bar and hit the enter key. Confirm you will be careful if the warning message comes up. To undo the change, repeat the first three steps of the process described above. As the fourth step, right-click the preference name and select Reset from the context menu. It is easy to make the switch. While all of the functionality remains as it was before, you may want to monitor the success rate or accuracy of information for a while to make sure that Mozilla's own geolocation service returns satisfactory results. The results will get better over time, and it is likely that Mozilla will replace Google as Firefox's geolocation provider with its own service at one point in time. The guide revealed how Firefox users could switch from using Google as the location provider in the browser to using Mozilla's own service. Hm. It may not negate all privacy concerns, but it looks like (using Google’s service) you’re assigned a random client identifier that expires every 2 weeks. On the other hand that ‘random’ identifier is assigned by Google. Much as I dislike Google I shall stick with them for geolocation. The reason? It thinks I’m about 1500km from where I actually live.